Fascinating analysis. So how have the Koch brothers managed to mobilize a sizeable percentage of the US population (the "Tea Party") to protect their interests - which are really only of those of a handful of billionaires? And at least two of those billionaires (Buffet, Gates) would appear to disagree with the general thrust of Tea Party policy. Thank you for the comment, Paul. 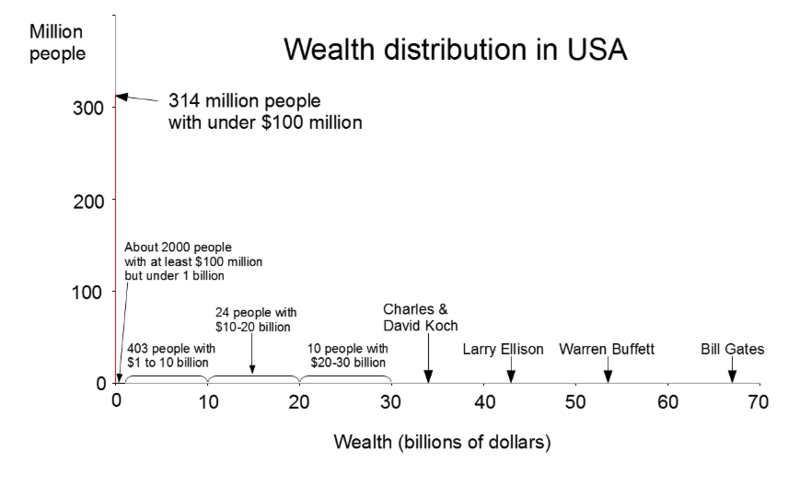 One thing that may not be clear on my graph is David Koch and Charles Koch have $34 billion each; together they have more than Bill Gates. There's a very long list of regulatory capture billionaires. Even historically, what catapulted the big 3 automakers ahead of all the others was not better technology but the fact that they got government contracts and the others didn't. During WWII Packard got the single best contract-manufacturing the Rolls Royce Merlin aeroengine with its two stage, two speed centrifugal blower. They also had a huge PT boat engine contract. Nevertheless they were out of business by 1956.